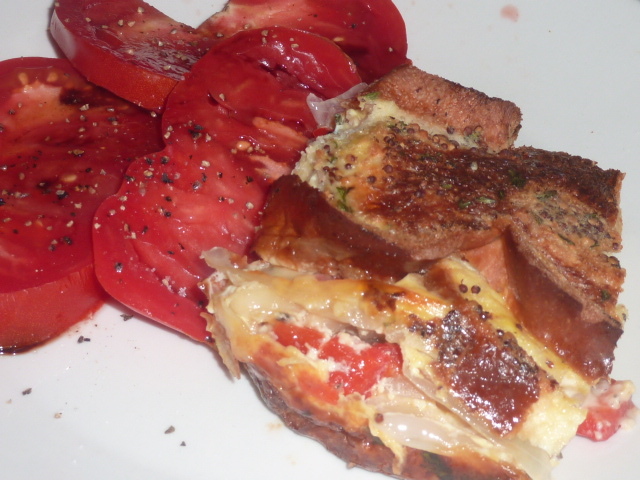 This savory French toast with sliced tomatoes is one of my favorite breakfasts of all time. I recalled it when thinking about what to make with all of our lovely CSA ingredients and decided to make a variation on it. This version was absolutely delicious. 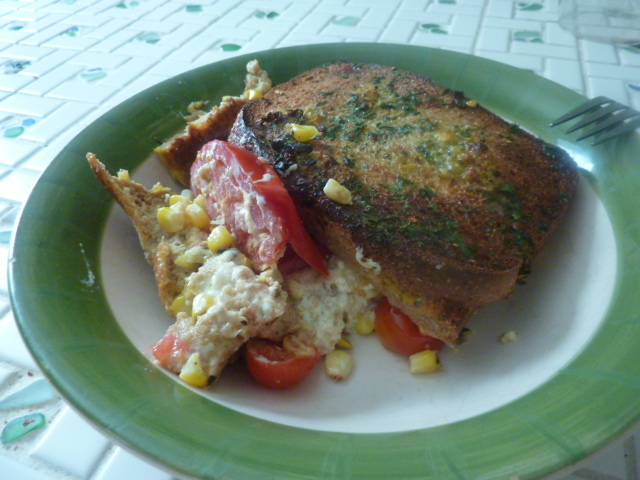 I love the way the bottom layer of the toast is creamy and soft, while the top layer of toast gets crispy and crunchy. The flavors of rich garlic and butter combined beautifully with the sweet roasted corn and slightly sweet, slightly acidic flavors of the ripe tomatoes to provide a wonderful foil to the tangy, creamy goat cheese. I had this dish assembled the night before I ate it so I could stumble out of bed, put my coffee on, and start preheating the oven. All I had to do was worry about putting it in there and then devouring it’s deliciousness about forty five minutes later. This was perfect for me because it takes some time for me to get revved up and hungry in the morning. It would also make a great breakfast for overnight guests, since you have to spend no time at all in the kitchen away from your guests. Spray corn with non-stick cooking spray. Season with kosher salt and freshly cracked black pepper. Turn a gas burner on the stove onto medium heat. Place corn over flame and cook, turning occasionally, until corn is charred deep golden brown. Let cool and then stand the corn on its end and cut kernels off the cob. Set aside kernels. Whisk together eggs, milk, crushed red pepper flakes, kosher salt, and freshly cracked black pepper. Spray a small casserole dish with non-stick cooking spray. Place two slices of bread on the bottom. Daub about half of the butter evenly over the bread. Top with crumbled goat cheese. Place cherry tomatoes, tomatoes, and minced garlic on top of cheese. Place two remaining bread slices atop vegetables. Pour egg mixture over bread. Let sit a minimum of thirty minutes to allow egg mixture to be absorbed by bread. You may soak it for up to 48 hours, but make sure all the liquid hasn’t settled to the bottom. Place casserole dish, uncovered, in oven and bake for 30-40 minutes until puffed and golden brown. Remove from oven and allow to sit for about 10-15 minutes to set. What do you make for dinner when all you have in the house is one gigantic tomato, half a loaf of nearly-stale bread, some onions, garlic, and half a bell pepper? Baked pasta with a yummy bread crumb topping is one option, but I wasn’t in the mood for pasta. I had heard about the concept of savory French toast and it had piqued my interest, especially since I don’t have much of a sweet tooth, so I decided to attempt to whip up my own version and, boy, am I glad I did. Despite its humble beginnings, this dish was absolutely delicious. I mean, yum! Despite the bread, milk, eggs, and cheese, it was pleasantly light. The flavors really packed a punch. Don’t skimp on a grocery store tomato with this, though … home grown or farmer’s market only or it just won’t do this home run dish justice. This dish is perfect for a crowd because it can be prepared ahead of time and just thrown in the oven. The next time (first time?) I host a brunch, this, or a variation of it, is definitely going to be on the menu. YUM. In a medium sauté pan, heat 1 tbs. of olive oil over medium high heat. Add garlic and onions and sauté until onions are translucent, roughly 3-5 minutes. Add diced pepper and sauté another 5 minutes until onions are a light golden brown. Transfer contents of sauté pan to a small bowl and let cool. In another small bowl, beat eggs, milk, dijon, dried parsley, a pinch of salt and freshly cracked black pepper to taste. Spray a small casserole dish with non-stick cooking spray. Place one layer of bread on the bottom of the pan (roughly 3-4 slices). Pour roughly 1/4 of the egg mixture over the bread slices, then daub a little bit of the butter over it. Layer 1/2 shredded cheese over bread slices. Place cooled vegetable mixture over top of cheese and add remainder of cheese on top of that. Place remaining bread slices over top. Pour remainder of the egg mixture over the bread. Allow the bread to sit for a minimum of half an hour but up to 48 hours in the refrigerator to allow time for the egg mixture to be absorbed by the bread. Preheat oven to 400°. Place casserole dish, uncovered, in oven and bake for 30-40 minutes until puffed up and golden brown. Remove from oven and allow to sit for ten minutes to set. It should look like picture following the break. Serve alongside sliced tomatoes with a tsp. or so of balsamic vinegar drizzled over top and seasoned with kosher salt and freshly cracked black pepper.